With the hustle and bustle of Christmas preparations it may seem a little insensitive to be speaking of peace at one of the most hectic times of the year. And yet, Peace is Christ’s gift to us, now during the Christmas Season, and always. Scripture tells us that Christ is our peace, the origin of peace in all our relationships beginning with our Heavenly Father. Peace, the fruit of prayer, overflows into our relationships with others, instilling in us Christ’s peace which in turn we can extend to others. It must have been glorious to witness the heavenly host of angels singing “Glory to God in the highest and on earth peace to men of good will.” But did the shepherds pause to consider the meaning of the angelic salutation, “peace to men of good will”? Being of good will as a prerequisite for attaining peace should give us pause, if not provocation to ponder the meaning of “good will”. Perhaps we need to look at our willingness to surrender everything to God, to allow God to do anything He wants with us: to hold nothing back and to trust Him with our life. We could take the Blessed Virgin Mary, the humble handmaid of the Lord as our model. Not knowing what the future entailed, she gave herself completely into the hands of God: “Let it be done to me”! May our Christmas gift to the Infant Christ be one of self-gift: I give you my life, it is entirely Yours! May we all beg for the courage and the grace to make this great offering of love to the Father, holding nothing back in our gift of self as we abandon our lives to God. 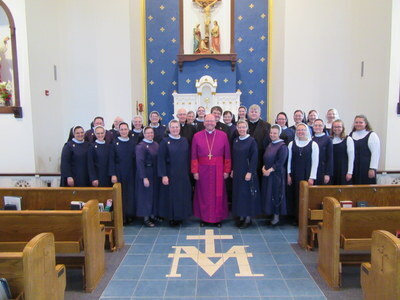 On the ninth of June in two thousand and eighteen in the year of Our Lord, the Motherhouse Property of the Sisters of the Immaculate Heart of Mary of Wichita was consecrated to the Sacred Heart of Jesus and to the Immaculate Heart of Mary. Because it is our ardent desire to usher in the Triumph of the Immaculate Heart of Mary we deeply hope that you will personally unite with us, joining us with your own individual and family consecration, and, in doing so, encouraging those you love to be united with Jesus and Mary. Our family consecration proclaims that we belong to Christ and live under the protection of His Blessed Mother. Christ reigns in our family as we turn everything over to Him. By enthroning images of Jesus and Mary in our homes we are reminded that God dwells in our homes and is at the center of our lives. Our consecration enables us to welcome Christ into the midst of our families that He may live and share our lives in a special way from this day on. As co-workers with Christ in His Redemptive work, we join Our Blessed Mother in collaborating with the Father in His plan of redemption. God chose Mary at the Annunciation, to be His Mother, and on Calvary, Jesus from the Cross, revealed that Mary is mother to all of us, her spiritual children. As our spiritual mother, Mary gives birth to Christ in us, she, in union with the Holy Spirit who makes us holy, forms us into saints. Through our consecration we give her the freedom to work in us and complete the work she has been given, namely to make us saints. The Enthronement of the Sacred Heart and the Consecration to the Immaculate Heart very much fulfill Our Lord’s words spoken to Venerable Lucia when she asked him why the consecration of Russia was necessary. He replied: Because I want my whole Church to acknowledge this consecration as a triumph of the Immaculate Heart of Mary, in order to later extend its devotion and to place the devotion to the Immaculate Heart aside devotion to My Sacred Heart. The Sisters of the Immaculate Heart of Mary of Wichita hope and pray that you begin, renew and grow in holiness through your devotion to the Sacred Heart of Jesus and the Immaculate Heart of Mary. We know it well, we hear it often, proclaimed year after year in Advent, Lent and Ordinary Time. Jesus, on the Cross prayed for it, Our Sorrowful Mother never forgot it, often reminding us of it, and the Saints lived and died preaching it! Praying and sacrificing for sinners is the heart of the gospel message. “Da Mihi Anima!” (Give me souls) is in the heart of every good priest, like Saint John Bosco, and must be in our hearts as we heed Our Lady’s unending request: Pray for the conversion of sinners! When I was hearing confessions in a church on the eve of the first Friday each month, a young woman entered and began: “I am not here to go to Confession; I am here to kill time.” I asked: “How much time would you like to kill?” She said: “About five minutes.” Again, I inquired about whom she was trying to fool besides God. “My mother, she said; “she thinks I am going to Confession. 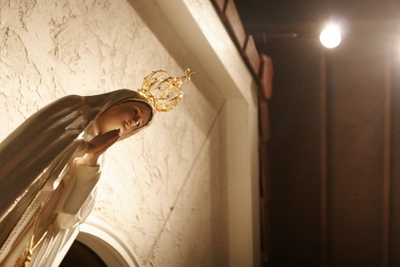 She is waiting outside for me.” I asked her if she were afraid to go to Confession and she said that she was. I said: “Well, if I could see you, I could probably make your confession for you. Will you let me take down this veil between us and turn on the light?” She agreed. I said to her: “You are a streetwalker.” “Yes,” she answered. “Well, that is your confession, is it not?” “No”, she said, “there is something else.” I begged and pleaded with her for twenty minutes or more to tell me- but to no avail. I then asked her to kneel at the Communion rail for a few minutes before leaving the church. She said that she would think it over. On leaving the church, I met her on the steps. I pleaded with her again for a half hour to tell me why she would not go to the Sacraments. “I will tell you,” she said, “and then I will leave. Because I was arrested for streetwalking, I was put into the home of the Sisters of the Good Shepherd. I promised the devil that I would make nine sacrilegious Communions if he would get me out of the home. On the ninth day I escaped.” With that she ran away. When I went back that evening for confessions, I asked every penitent to recite the Rosary for the conversion of a sinner. All agreed except one. I finished hearing confessions about nine o’clock, went to the Communion rail and knelt there from nine until twelve-thirty praying for her. At twelve-thirty the front door opened. I was almost afraid to look, thinking it might be a policeman worried about lights in the church after midnight. It was the girl, who walked immediately into the confessional, to make her peace with God. There is no mistaking it, prayer and sacrifice bring about conversion. Venerable Fulton Sheen, pray for us, that we may be blessed with an increased fervor in praying for the conversion of sinners, and zeal for souls! Praying for sinners begins with Mary at the Foot of the Cross. With every Hail Mary we pray, we implore Our Lady to pray for us who are sinners in need of conversion. Our Lady not only hears and answers our prayers, but she asks that we join her in this work of redemption at the Foot of the Cross. Our Blessed Mother’s prayers of intercession for her children are indisputably powerful and efficacious, however, we too, have a mission to pray and sacrifice for the conversion of sinners. Mary never tires of pleading with her children to pray the Rosary for the conversion of sinners that we might begin to grasp the price of our salvation, namely the life, death and resurrection of Her Son. It was the conviction of our Founder, Father Joaquin Masmitja, that Mary’s greatest suffering was the knowledge of souls who would refuse the graces wrought through Jesus’ Sacrifice on the Cross. He wrote: “This Institute of the Immaculate Heart meditates on the cruel sword of sorrow that pierces this Heart at the sight of sinners renewing the passion and death of her Son and despising the merits of the blood shed for them with so much love. It seeks especially, through prayers and other pious practices to obtain from the Divine Mercy an interior grace for sinners, so that abandoning the state of sin, they will turn to God, the center of all happiness.” This month we celebrate the Feast of the Triumph of the Cross, the great work of Christ’s redemption of mankind. On the following day, we celebrate Our Lady of Sorrows who reminds us that we too, have a role in Christ’s redemptive act by praying for souls, first my own and then for everyone else’s. Praying for the conversion of sinners begins with my own ongoing conversion. Countless saints and scholars, including St. Teresa of Avila, St. Ignatius of Loyola, Adolph Tanquery, Garrigou-Lagrange, to mention only a few, have written in great detail on the stages of the spiritual life. I think in our present situation we could begin with the basic question posed by our beloved St. John Paul the Great: Am I living as a practical atheist, one who says he believes in God, but lives as if God did not exist? This is basic, but how often do I remember to pray, to seek God’s help, His will, His counsel, His grace, or to thank Him for His steadfast love and mercy? Conversion is the work of everyday life, every day. In the spiritual life, if I’m not progressing, I’m regressing. An excellent spiritual tool to keep us attentive to the Lord throughout the day and honest with ourselves with regards to our progress, is the Ignatian Rules for Discernment of Spirits and the Examen Prayer. Father Timothy Gallagher, OMV has masterfully written on these subjects, and has made these time-tested tools easy to practice in our busy everyday lives. With all my heart, I encourage you to look into purchasing these books for your spiritual growth. As a teaser, or perhaps a vehicle to spur you on, the following is an outline of the Examen prayer which you will find in Fr. Gallagher‘s book on the Examen. However, this does not take the place of reading Discernment of Spirits, which I believe can change your life. An Outline of the Examen Prayer: This is a prayer, not merely an exercise or examination of conscience. Transition: As I begin this Examen, I place myself in God’s presence as I become aware of the love with which God looks upon me. Step One: Gratitude. I note the gifts that God’s love has given me this day and I give thanks to God for them. I call to mind the large and small blessings received. I let the Lord tell me the concrete story of his love in the hours of this day. Step Two: Petition. I ask God for an insight and a strength that will make this examen a work of grace, fruitful beyond my human capacity alone. Step Three: Review. I look concretely at my activity, my work, my prayer, my service, as the day unfolded, hour by hour. Again, what was stirring in my heart? Spiritual consolation? Spiritual desolation? What can I recall of my thoughts? What was God showing me in these events? What decisions did I make, in response to this person whom God placed in my life this day, in handling this task, in my life of prayer this day? Step Five: Renewal. In the light of all that I have seen looking over my day, I now look to tomorrow, and seek God’ s light on how he is calling me to grow spiritually in the specific circumstances of the day that awaits me. Transition: I prayerfully conclude the examen with an Our Father or another prayer. As we live out each day with more attentiveness to God, the Examen Prayer will be the tool which will help us recognize God’s action in us. May you be as surprised as I was when you become aware of God’s presence within you and His loving attentiveness throughout your day. Praying for the conversion of sinners begins by looking intensely at our own spiritual life and asking Our Blessed to pray for us. With every rosary we pray, let us remember Our Lady’s request and know that our own conversion, and the conversion of all sinners, is included in every “Hail Mary”. For years, since my first pilgrimage to Fatima, Portugal in 1981, I have had many occasions to tell the story of Our Lady of Fatima and her apparitions to the three shepherd children in 1917. Upon my return from Fatima, my friends and family were naturally curious to hear the story and learn its message. At first, what fascinates and attracts many to the Fatima story is the supernatural phenomena of visions, particularly the vision of hell, the three secrets and the miracle of the sun. Also inspiring is the courage, conviction and heroic virtue of the three shepherd children only 7, 9, and 10 years old, who were entrusted by Our Lady with a mission to spread the message of peace and salvation of God throughout the world. Five Popes have made pilgrimage to Fatima to pray to Our Lady for peace and the conversion of the world. This past month, on May 13, Pope Francis traveled to Fatima bringing worldwide attention to the Message of Fatima, and canonized Jacinta and Francisco, who heroically fulfilled Our Lady’s requests to pray and make sacrifices for the conversion of sinners. Shortly before he passed away, Saint Pope John Paul the Great said, “Fatima is more relevant today than it was in 1917”. Throughout the 20th century we saw fulfilled Our Lady’s warnings of war, persecution of the Church and the Holy Father. Today, especially we see the errors of Russia, specifically atheism and the rejection of God throughout the world. 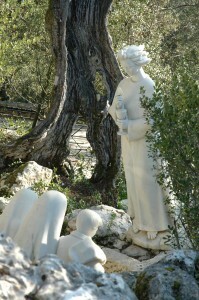 She asked the children: “Are you willing to sacrifice yourselves and bear all the sufferings He wills to send you, as an act of reparation for the sins by which He is offended, and for the conversion of sinners?” Some marvel, that 100 years have passed and we have yet to fulfill all the requests of Our Lady of Fatima. For many of us, perhaps the message got lost in the marvelous details of the story. I learned the story, the prayers taught to the children, the details of each month’s apparition, and the sufferings of the children who remained faithful even when threatened to be boiled in oil. But there is more to the story, in fact we are all part of the story, and it is up to us to determine how it will end. Our Lady exhorts all her children to work for the salvation of souls. By offering up every day the sacrifices demanded by our daily duty, praying the daily rosary for the conversion of sinners, and making the Five First Saturdays we will have world peace. Mary promised at Fatima, “In the end, my Immaculate Heart will triumph.” By cooperating with her requests, including the Five First Saturdays, we will hasten her triumph. The message of Fatima today is one of great hope. The sons and daughters of Mary are on the march. In fact, a virtual army of Marian saints, well over 1000 people, came to our Shrine of Our Lady of Fatima here at our motherhouse property on May 7, to pray before the International Pilgrim Virgin Statue. 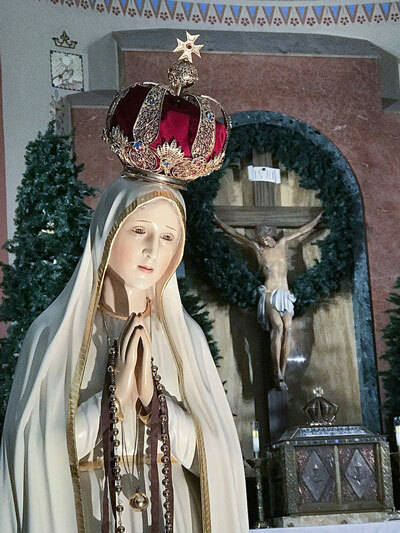 A week later, for the semi-annual procession on the 13th of May, well over 500 people came to gain their plenary indulgence and place their prayer intentions at the feet of Our Lady. In this Centennial year of Our Lady of Fatima, there is great cause for hope as we heed the message of Fatima and live a life of personal conversion, Marian consecration, sacrifice and prayer for the conversion of sinners and world peace. May Mary’s Heart Immaculate be forever praised! Each day for 88 years, Sister Lucia lived the Fatima Message. This year as the Church commemorates the 100th Anniversary of the apparitions at Fatima, we, too are called to seriously consider heeding Our Lady’s requests, the consequences if we don’t, and engaging in the very means by which to heed her warnings, and the decision to pray and sacrifice for the salvation of souls. For some time now, the Sisters and I have been concerned about the incessant attacks on the sanctity of marriage and the family. These attacks are real, not imaginary, and we cannot ignore them. The attacks are becoming more and more intrusive, and are being delivered in various and subtle ways through entertainment, magazines, television, music, books, politicians … too many and too numerous to list. We must become ever more acutely aware of the ways being used to undermine marriage and the family structure because these methods are indeed affecting our children, our families and society. Are we fearful to proclaim our love for Jesus in the public aspect of our lives? To embrace the foot of the Cross? To preach from the rooftops, as exhorted by Pope John Paul II? The message of Fatima, 100 years later, is just as relevant as it was at the time of the apparitions. Our Lady’s message is to pray for the conversion of sinners, make reparation for the sacrileges by which He is already so much offended, and as Lucia exhorts us, to defend and protect the family. Our Lady loves us, she dotes on us, as every mother does. But a loving mother must also correct and teach her children. Our Lady of Fatima taught us the need for penance, reparation, praying the rosary for the conversion of sinners and fulfilling Jesus’ requests for the First Saturdays. Our Heavenly Mother has asked this of each of us in our everyday lives. Perhaps to soften our hearts, Our Lady has chosen children to remind the world of God’s love for His Family and to call the world to conversion. The Angel of Peace, in his last apparition at Fatima, came holding a chalice in his hands with a host above it. Without a word, the Angel knelt with his forehead touching the ground, leaving the host and the chalice suspended in the air. The Angel prayed, three times, “Most Holy Trinity, Father, Son and Holy Spirit, I adore you profoundly, I offer You the most precious Body, Blood, Soul and Divinity of Jesus Christ present in all the tabernacles of the world, in reparation for the outrages, sacrileges and indifference with which He Himself is offended. And, through the infinite merits of His most Sacred Heart and through the Immaculate Heart of Mary, I beg the conversion of poor sinners.” Imitating the Angel, with their foreheads pressed to the ground, the children joined the Angel in reciting the prayer three times. The Angel stood up and gave Lucia the Eucharistic Host. Then he gave the Chalice with the Most Precious Blood to Jacinta and Francisco, as he said, “Take and drink the Body and Blood of Jesus Christ, horribly outraged by ungrateful men. Make reparation for their crimes and console your God.” Once again, he prostrated on the ground before the raised chalice and Host, and repeated again the prayer three times, and then he disappeared. Jesus gave us the Holy Sacrifice of the Mass to perpetuate Calvary, enabling us to participate in His work of redemption. Father Frederick Miller writes in his book, The Message of Our Lady of Fatima, “The Church, the Mystical Body of Christ, following Mary as model and guide, unites her self-sacrifice to Christ’s and becomes His co-worker in the world.” Standing beside Our Lady, we are collaborators in her Son’s redemption of the world. In our participation at Holy Mass, Our Lady draws us to be with her at the foot of the cross and there we join our prayers and sacrifices with her Son’s sacrifice, for the salvation of the world. The Angel of Peace came approximately one year before Our Lady presented herself to the children. The children, forever changed, prayed the prayers taught to them by the Angel and prayed the Most Holy Rosary daily to make reparation. They looked for ways to make sacrifices to console God. Our own lives should be such. Do we pray and work for the sacredness of marriage and the family? Are we afraid of the truth and teachings of the Catholic Church? Do we pray the rosary every day as Our Lady has requested? Do we look to the Blesseds and the Saints for inspiration? The three children of Fatima were brave little souls and suffered much from their families, the people around them, and the ruling authorities of their time, but they willingly and lovingly laid down their lives for God and the truth of the Catholic Church. This Lent, during the Centennial year of Fatima, let us heed Our Lady of Fatima’s exhortation to do penance and make reparation. We need to place ourselves under Our Lady’s mantle to receive her strength and grace as we pray for marriage and the family. My Lenten reflection for you this year is to ponder in your own hearts what God the Father, Son, and Holy Spirit is telling you in these three simple words, “Be not afraid”. May your Lenten journey be filled with penance, reparation and consoling Jesus at the foot of the cross with our Blessed Mother. May you be filled with joy as you give public praise to the Triune God. May you “be not afraid” as you defend marriage and the family. May your response to our Blessed Mother’s request be extraordinary! May Mary’s Immaculate Heart triumph! The liturgy is a great teacher, for not only is this great solemnity the end of the liturgical year, but it also provides a fitting transition into the new liturgical year. The liturgies of Advent help us prepare for the birth of the King. I have been thinking about those days more than 2,000 years ago when Christ was born in Bethlehem. Have you ever thought about how many events were coalescing and how God was bringing about the fullness of time? God foresaw and used the Roman census to realize His plan; Joseph and Mary traveled to Bethlehem and the Old Testament prophecy was fulfilled. 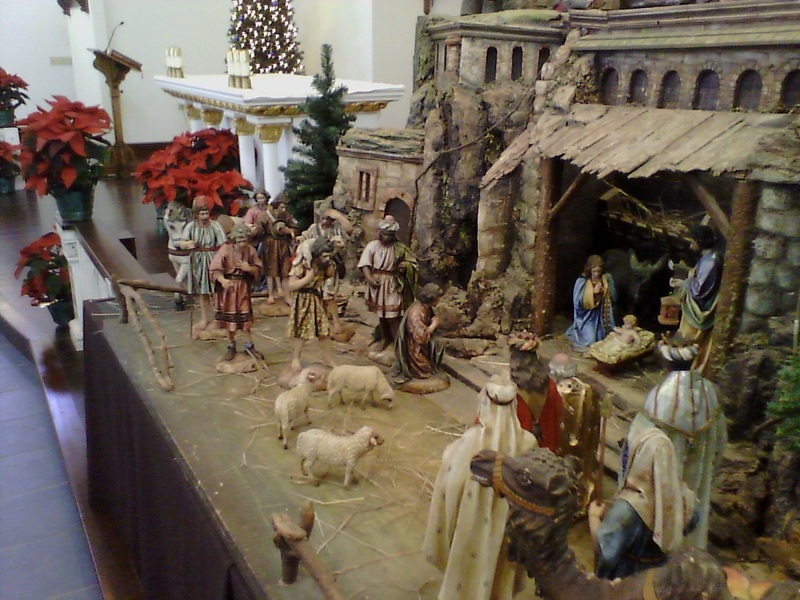 The Light of the Nations was born in a stable. Even as an infant, perhaps even before He was born, the Divine Light of Jesus was guiding, drawing others to Himself. 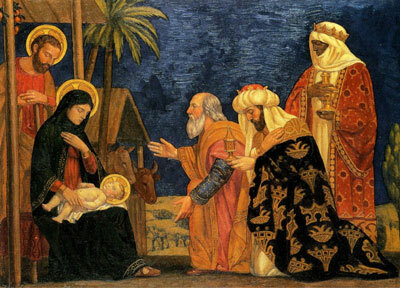 The Magi were inspired to follow the star of the newborn King, to honor and pay homage to Him. To cite the wisdom of Pope Benedict XVI, “The Wise Men from the East mark a ‘new beginning’ … the journeying of humanity toward Christ.” This journey is one that must never end in this life. The Magi risked everything following this star into foreign lands! Despite dangers and their critics, they had the conviction to follow the star. We will never know what inspired them to do so, yet the fact remains that at great risk to themselves, they did. They set out to follow that star…that light…and they were persistent throughout their journey. Even when the star disappeared, they did not abandon their purpose, requesting a meeting with Herod who, surely, would know the location of the newborn King of the Jews. King Herod, though, did not share the hopes or the natural faith of the Magi. King Herod’s role in these events also needs to be examined, as he is the first to persecute families because of the birth of the Christ Child. Perhaps this is where the attack on the Christian family first began and this attack has continued ever since. Herod’s malevolent atrocities in his attack on the innocent have carried forward from generation to generation. Advent is the perfect check point for us on our journey, a perfect time to reflect on these things, a perfect time to think about Herod, the Magi, and Pope Benedict XVI’s observation that this historical event marked the beginning of mankind’s journey toward Christ. Are we truly proclaiming Christ as our King in our lives or are we to be counted among those about whom God spoke to Samuel, that is, those who reject God as king? Christ is the Light of the World; as Christians, we too are to bring light to the world. Be the light in your homes, be the light in your families, be the light in your work place, be the light in your school, be the light in your cities, be the light in our country, be the light in the world. Everyone you meet is longing for God, desires to love Him and be loved by Him. May your light introduce them to Him anew. With a heart full of gratitude to you and to God, greetings from our home to yours! We have lived in new home now for eight months and not a day goes by that we do not whisper a prayer of gratitude for the blessing of our new convent. For the first time, we are living in a home that was designed and built to help us express who we are and to aid us in departing to you and all of our visitors that same charism. These months have been filled with untold and multitude blessings. Our Blessed Mother makes the house a home, a suitable place for Her Son to dwell, and draws her children together under her loving gaze, assisting their approach and propelling them to her Eucharistic Son. Our Chapel, the Chapel of Our Lady of Sorrows, is very Marian, but Marian primarily in the sense that the center is Jesus. How blessed we are to have a convent, a home, that expresses what we strive to live! This reality was brought to our attention forcefully when a young woman called and said that she watched our convent being built as she drove by to and from her brother’s home. She was drawn by the building and wanted to visit, to see what was inside and to see how we lived. Three other young women have submitted their applications for entrance; three young women, all from Kansas, have felt the call to be in Our Lady’s home, sensing that perhaps Jesus is calling them to be His brides. Our Lady is showing them, and us, the way and we joyfully and with full confidence, entrust ourselves to her motherly care. This is our lived experience and it is exemplified this summer by Sister Joseph Mary O’Brien’s Silver Jubilee (August 15, 2016), by Sister Mary Guadalupe Bergkamp and Sister Rose Marie Weber’s solemn consecration and perpetual profession (August 20, 2016), and the reception into the novitiate of Maggie Schaeffer in September. You have helped us so much by “building our house with Memorares.” Thank you for the thousands of Memorares you and all of Our Lady’s friends have showered upon her, all for the conversion of sinners, for the Sisters, and for your own needs. Thank you for being an instrument of Our Lady. May Mary’s Heart Immaculate be forever praised, that Her Son may be glorified, now and forever. Just like clockwork… or was it by God’s Design that made “all things work together for the good of those who believe”. The Sisters often marvel at the providence of God who gives us what we need when we need it, arranging our daily lives with such loving solicitude. Things could not have worked out better. Five days before Thanksgiving the Sisters with the help of family and friends moved in to their new home in time to prepare for our first holiday at the Novitiate House. Our move coincided with the visit of Maggie Schaeffer who plans to enter in February. She and her father joined in the fun of moving the Sisters and getting a first look at Maggie’s new home. What a blessing for us and Maggie to have this shared memory. Build and they will come proved true one week after Thanksgiving when the Sisters hosted their first group of young women for a Come and See weekend. Six young women traveling from La Crosse spent time with the Sisters, praying, working and playing, experiencing the peaceful and beautiful atmosphere of the Novitiate House. May this be only the beginning of discernment retreats for young women in search of God’s will and a good community! Blessings abound as our prayer for strong, dedicated and persevering young women for our community is answered. Anne Marie Laville from Leawood, Kansas and Samantha Ridder from Hutchinson became postulants in the Fall of this year, sharing with us the beginning of a new chapter in the history of our community. Their joy, enthusiasm, hard work, and desire to do all for Jesus is an ever present reminder and confirmation of the need and importance of building a Novitiate House to foster vocations to the Religious Life that we may continue to serve the Church through our prayers and apostolate of education. Thank you for working and praying beside us these past several years. Our hope in the Lord has never wavered knowing that He is always by our side. Our prayers are offered for you unceasingly, and as long as there are Sisters of the Immaculate Heart of Mary, they always will be. Unable to accommodate all our friends and families, the Blessing of our Chapel and the Novitiate was private. We do plan to have several Open Houses after the first of the year for all of you. Please stay tuned. It wasn’t fear that inspired the founders of the Legion of Mary, the Blue Army, and the Militia of the Immaculata to take their place in the service of the Queen. Nor is it fear that moves us, as we consider the danger and the risks of entering the fray and engaging in the ensuing battle. It is love that casts out fear and fills us with great joy and confidence in Our Lady who promised, In the end My Immaculate Heart will triumph. Our Holy Father recently spoke on the need for courage, like that of the Apostles and the first Christian community. He said, this courage carried forward the work of evangelization, free of fear, of death and martyrdom. As we look back over the history of the Church we see the heroic courage of the saints in the face of great persecution and know we have the same call to such heroism for the sake of the Church, the Kingdom here on earth. In these times, and in every time, the followers of Christ are called to live courageously, to be resolute in their faith and in seeking and doing God’s will with a magnanimous heart. The Sisters and I know several vocations are just around the corner for us. We need to pray for them, for their courage to do God’s will, and to be undaunted in their desire to do great things for God and for His Church. Please join us in praying for strong, dedicated and persevering young women for our community.